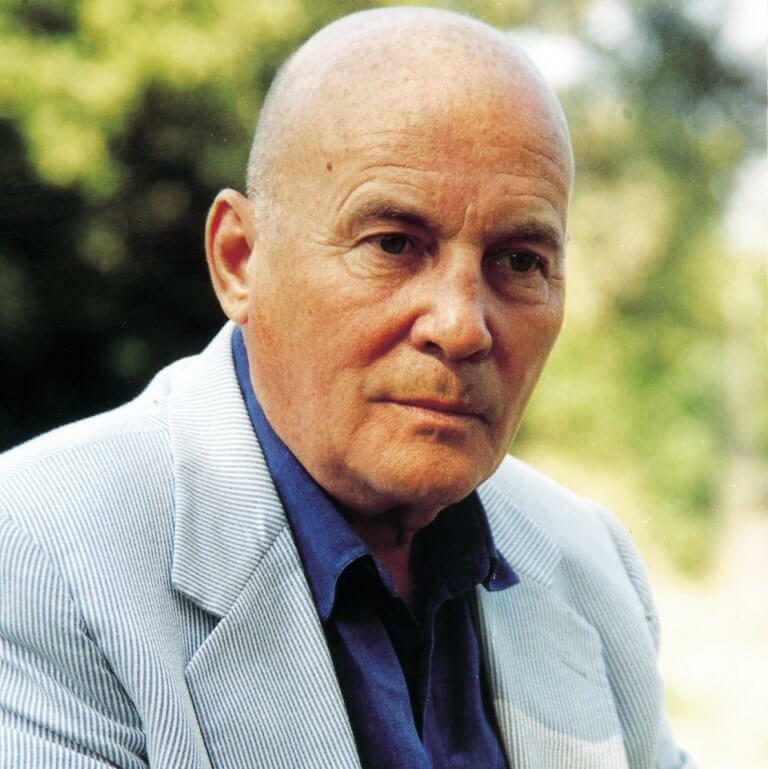 Born in Gütersloh on 1 July 1926, Henze received his earliest musical training at the Braunschweig Staatsmusikschule. As a child, he witnessed the branding of modern music, art and literature by the Nazis. After having worked as a répétiteur at the Bielefeld Stadttheater Henze began to study with Wolfgang Fortner at the Heidelberg Institute for Church Music in 1946. In the late 1940s he came across serialism and began to attend the Darmstadt Summer Courses for New Music. After fulfilling his engagements at the Constance Theatre and the Wiesbaden Hessisches Staatstheater, Henze left Germany in 1953 and settled in Italy. It was also the geographical distance to the German contemporary music theory that helped him to achieve new varied forms of expression in his own music. In the late 1970s and early 1980s Henze turned to more traditional forms. From 1962 to 1967 Henze taught a master class of composition at the Salzburg Mozarteum while other teaching assignments led him to the USA and Cuba. In Cologne Henze held a chair at the Staatliche Hochschule für Musik from 1980 to 1991. In addition, he was appointed composer-in-residence at the Berkshire Music Center in Tanglewood/USA in 1983 and 1988-1996 as well as of the Berlin Philharmonic Orchestra in 1991. In 1976 Henze founded the Cantiere Internazionale d’Arte in Montepulciano and in 1988 brought the Munich Biennial: International Festival of New Music Theatre into being which he headed until 1996. Henze’s oeuvre as a composer is very comprehensive: He wrote solo concertos, symphonies, oratorios, song cycles, chamber music. It was especially the works for music theatre that have made Henze one of the most frequently performed contemporary composers of our time. The radio opera version of his early opera Ein Landarzt based on Franz Kafka’s story of the same name was awarded the ‘Prix Italia’ as early as 1953. His varied opera repertoire includes works such as Das Wundertheater (1948/64), Boulevard Soltitude (1951), a setting of the Manon Lescaut material, König Hirsch (1953-56), Elegie für junge Liebende (1956/61, rev. 1987), Die Bassariden (1964/65, rev. 1992), Pollicino (1979/80) as well as ‘Das verratene Meer’ revised in 2003/2005 (Gogo no Eiko, original version 1986/89). Henze entertained a close relationship with Ingeborg Bachmann, their joint collaboration resulting in works such as (1964), Der junge LordDer Prinz von Homburg (1958/59, rev. 1991) as well as Nachtstücke und Arien for soprano and large orchestra (1957). In the centre of Henze’s orchestral compositions are his ten symphonies, including Sinfonia N.9 for mixed choir and orchestra (1995-97) with verses by Hans-Ulrich Treichel based on the novel ‘The Seventh Cross’ by Anna Seghers – an impressive example of Henze’s examination of Germany’s National Socialist past. Sinfonia N.10, commissioned by Paul Sacher, was premiered at a widely acclaimed performance in Lucerne in 2002 by the City of Birmingham Symphony Orchestra under the direction of Sir Simon Rattle. Among the numerous awards and prizes received by Henze are: 1990 Ernst von Siemens Music Award, 1995 appointment as Accademico Onorario of the Accademia Nazionale di Santa Cecilia, Rome, 1997 Hans von Bülow Medal of the Berlin Philharmonic, 1998 appointment as Honorary Fellow of the Royal Northern College of Music, Manchester, 2000 Praemium Imperiale in Tokio, 2001 Cannes Classical Award in the category ‘Best Living Composer’, to mention but a few. 2003 saw his appointment as Chevalier de la Légion d’honneur, Paris and his receiving the Prize of the International Summer Academy Mozarteum ‘Neues Hören’ for the successful conveyance of new music. On the occasion of Henze’s 80th birthday in 2006, numerous international concert halls, such as the Konzerthaus Dortmund and the Kungliga Filharmonikerna Stockholms Konserthus, dedicated special concert series to him. In 2007 the recording of Henze’s melodrama Aristaeus with Martin Wuttke and the Berlin Radio Symphony Orchestra under the direction of Marek Janowski was awarded the Echo Klassik in the category ‘Best First Recording of the Year’.